In our October 2014 blog post, “Civil Rights, Then and Now,” we began an exploration of the progress toward Civil Rights in our country since the enactment of the Civil Rights Act of 1964. (You will find the previous blog post in our archives to the right, if you missed it.) This month, we bring you the conclusion as we share additional primary sources from this evocative period of American History, along with several powerful tools for you to utilize in your classroom from a recent panel presentation by TPS-GSU Students and Educators. The Teaching with Primary Sources Program of the Library of Congress at Governors State University is proud to have been a co-sponsor of this commemorative event. We invite you to pause for two minutes while you view the video below. You will be moved as you hear the responses of Third Grade Students of Tamara Berian viewing the events that occurred when our government attempted to achieve equal education through military enforced de-segregation of our schools. Listen as these Third Graders voice their opinions of the dramatic repercussions. 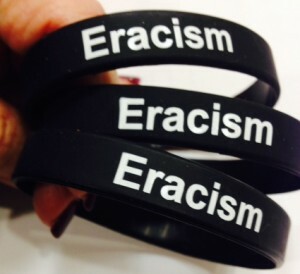 LESSON PLANS: Race Riots, Major League Baseball, Dr. Martin Luther King, Jr.
“Eracism” Wrist Bands … Do You Have Your Wristband Yet? The “Eracism” wrist bands to commemorate the 50th Anniversary of the Civil Rights Act of 1964 as part of the Student Research Conference at GSU on Nov. 6th were a huge hit! In addition to the workshop presented by TPS-GSU, there were many more excellent events during the 50th Year Commemorative Student Research Conference at GSU. Professor Larry Levinson was Chair of this Conference, and Dr. David Golland was the Keynote Speaker. 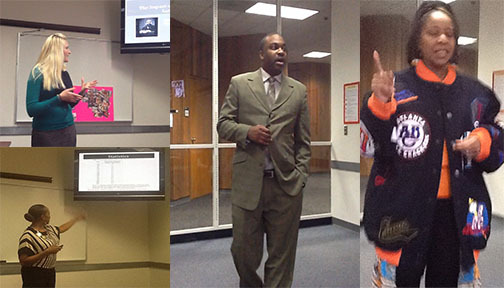 As an attempt to maximize student engagement in the commemoration, a number of faculty incorporated the theme of “How Far We Have Come, How Far We Have Yet to Go!” into their courses and encouraged their students to attend and present at the conference. Dr. David Hamilton Golland: Keynote Address – Affirmative Action ‘From The Ground Up’: The Civil Rights Act of 1964 and a New Definition of Equal Employment Opportunity (Facilitator, Larry Levinson). Play: A Raisin in the Sun, Directed by Dr. Patrick Santoro, Presented by GSU Theatre & Performance Studies. There were several performances of the play, with over 1100 elementary students in attendance at one of the performances.